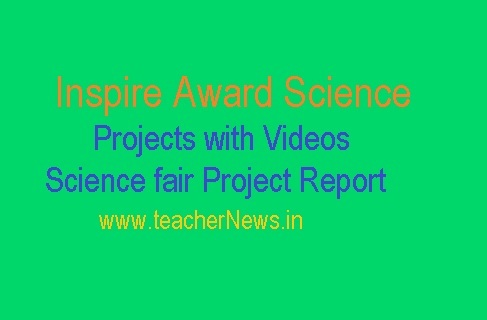 AP/ TS Inspire Award Science Projects with Videos - Science fair Project Report for AP TS Students: AP District Level Exhibitions Guidelines and Inspire Manak Awards AP District Level Exhibitions List of Schools.Download Inspire Award Science Projects and Experiments 2019. Very useful to who are attend to Inspire Award Science Projects programme. Download Inspire Award Science Projects Instructions - Preparing Project Report Book. AP Telangana Inspire Award Science Projects with Videos for Physical Science ( PS ), Biology Science, Robotics, Computer and Mathematics Projects and Videos. 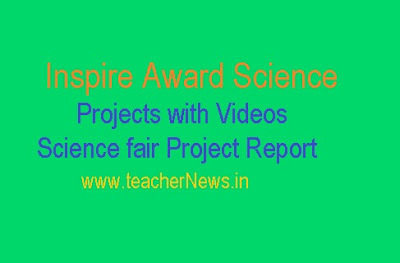 Inspire Award Science Projects with Videos - Science fair Projects download for District level and State level Inspire award Projects.Science fair Project Report and Write up here.